I had the pleasure of being invited over for afternoon tea at a true Englishman's home. As I knew what was in the making, I asked John if I could come over earlier to photograph behind the scenes. "...And suddenly the memory revealed itself. The taste was that of the little piece of madeleine which on Sunday mornings at Combray (because on those mornings I did not go out before mass), when I went to say good morning to her in her bedroom, my aunt Léonie used to give me, dipping it first in her own cup of tea or tisane. The sight of the little madeleine had recalled nothing to my mind before I tasted it...And all from my cup of tea." We all have those moments, don't we? I was curious to ask John if there was a scent in particular that evoked a moment from the past. "Hot milk reminds me of cold winter mornings getting ready for school; i.e., porridge for breakfast." Curdle your milk first and set aside while preparing the dough. To curdle milk, add lemon juice and the vanilla extract to the milk. Mix it together and set it aside to curdle for 15 minutes or longer. Sift the flour in a large mixing bowl. Add the sugar, salt, baking powder and rub in the butter. Make a well in the middle of the dough and add the curdled milk, and stir it up with a spatula. Gather the dough and place on a floured flat surface. Knead the dough and keep adding some flour while kneading until you have a soft dry dough that's not sticking to your fingers. Take a 5 centimeter round cutter and stamp out rounds from the dough. There should be a "whoosh" sound when you plunge your cutter into the pile of dough. Place it on a baking sheet. Continue to knead together the rest of the dough stamping out the rest of the dough in rounds. 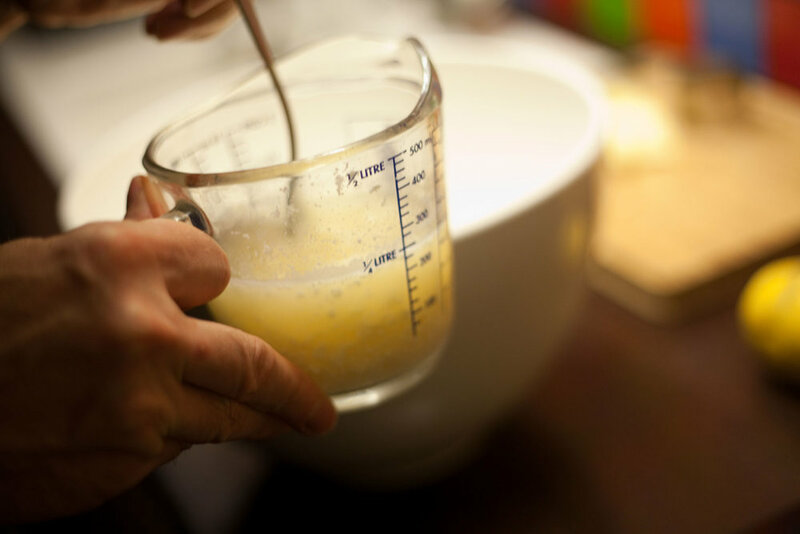 In a small bowl, crack an egg and whisk it for your egg wash. Using a pastry brush, slightly brush over the scone rounds with the egg wash.
Place them into the oven for 20-30 minutes at 170° C (about 335° F°). Check to see if they have risen and if they are golden brown before taking them out. Serve with clotted cream and a little jam.